What happens if your key person gets sick, loses connection, needs a break? Don't just pick up the extra load; make sure there's a reliable backup. In this episode, find out how you can prevent a common problem many business owners run into. Hey, James Schramko here, welcome to SuperFastBusiness.com. Today, I’ve got a quick tips lesson, and this is particularly important if you have a team. If you’re growing your business beyond just you as a single person, you need to pay attention to this episode. It’s only a short one, but a valuable lesson and a mistake that I see people making a lot. You see, the situation is, as your business evolves, you end up needing to transfer tasks from you to someone else, and I call that process the task transfer, funnily enough. Now as you transfer tasks, it feels great because now you don’t have to do the task and someone else is doing it. Where the problem happens is when that person who’s doing the task can’t complete the task properly or, heaven forbid, they want to have a holiday, or perhaps they’re sick. And this can happen, even in a regular office or whether you have an offshore team. So what I do in my business is I have a Noah Principle. 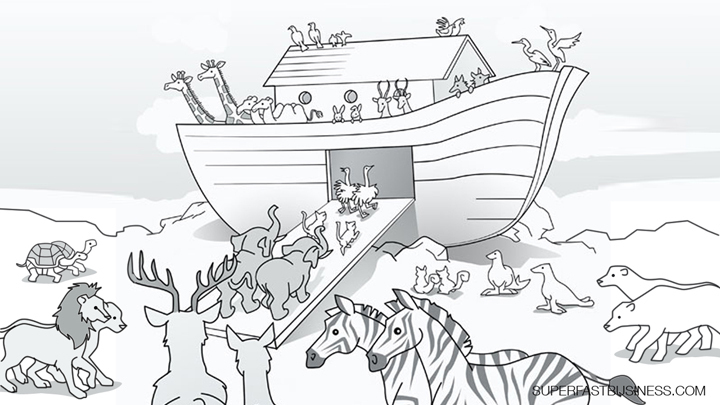 And the Noah Principle is just like Noah’s Ark, we have 2 of everything. That way, it’s easy for your team to have time off, to have natural disasters, to have Internet connectivity issues, it’s not going to drag your business down. Because the challenge is, when these things happen, you generally get dragged back into the task, and that takes you away from the higher value activities, so you become detuned or depowered from where you were. That’s why as quickly as possible, we have 2 people in our business who can do every single task. And that applies to bookkeeping through to email broadcasts through to content preparation through to podcast editing. There’s always 2 people. In fact one of the things I do in my weekly calls with my managers is I ask, “Who is your Noah?” and I make sure there’s backup. And I encourage people to have holidays, and when they’re away I deal with their Noah, and I make sure that they’re match fit, and they’re ready for the task. So if you can do this, you’ll avoid the main problem that happens to most small businesses, and that’s single point sensitivity. That’s a fancy name for saying, if you’ve got one of something and it breaks, then you’re screwed. So that’s how you do it. Make sure you cross train people. They don’t have to be in the Noah role permanently, they just need to know how to do it. So if you have 2 people in different roles, you should cross train them. Now what if you can’t afford a second person right now? Well, set a trigger point so that when your business is at the right level, that you can quickly scale up. Because I found it’s better to have more capacity than what you need versus not enough capacity. When you don’t have enough capacity, or the ability or resource to implement things, people notice that you get delays on services, you get dragged back into the fray, that’s not a good thing. Have overcapacity if anything because it’s much easier to ramp up your marketing. Your action step is to list down every single point of sensitivity that’s in your business right now. That is any task that only one person can do, and probably a lot of those will be up to you, and see what you can do to rectify that. Now you might be thinking, well James, what if you don’t do podcasts? Well some of the blog posts on SuperFastBusiness.com were written by the team and published by the team, without any help from me. And they’re not even podcasts, they’re just articles or blogs. So there is a backup plan. That is important at every single level of the business, including your level. If you liked this episode, I’d really appreciate a rating at iTunes, 5-star rating would be very, very well-received. And also, if you want some help from me and from other talented business operators, come along and join SuperFastBusiness membership, where for a low monthly investment, I can help you out with your business and you’ll get exposed to lots more training like this. This is just one thing, avoiding single point sensitivity. If you can overcome this, it’s going to set you up to gather a lot more momentum in your business so that you’ll be more profitable and you can actually enjoy your work instead of getting dragged back down the gurgler every time something happens. I hope you’ve enjoyed this episode. I’m James Schramko, I’ll talk to you again soon.